← Hospital food’s not so bad, if you’re in the right hospital! Having an obsession with something traditionally made with egg whites, double cream and/or gelatine is tricky as a vegan! 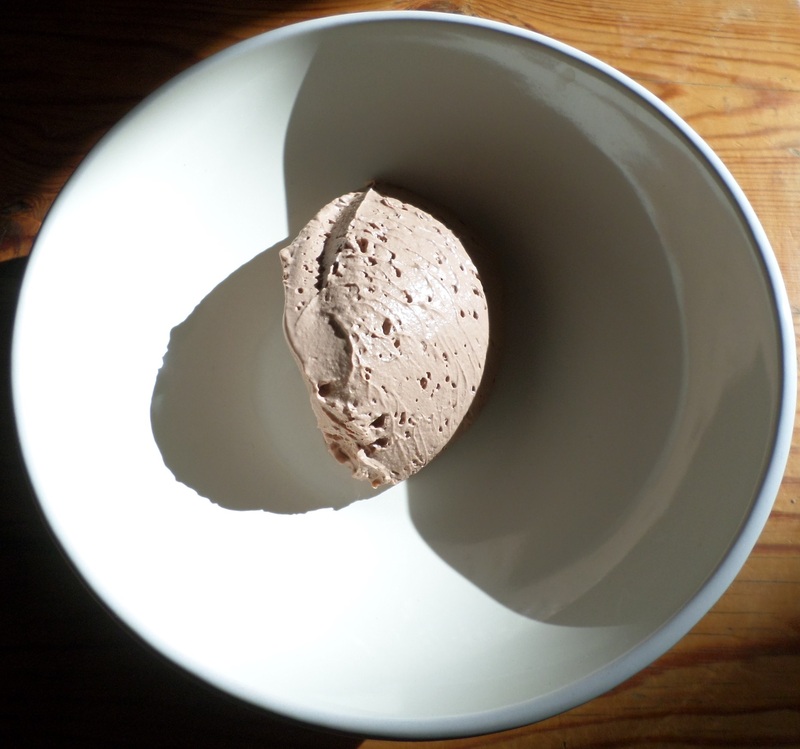 When I was a child, my mother used to make an incredibly boozy chocolate mousse using dark chocolate, egg whites, cream and liberal splashes of brandy. I remember eyeing up the individual glass serving dishes chilling in the fridge in preparation for dinner parties. Perhaps I got to “help clean” the mixing bowl and I am sure I got my own dish at dinner, but I would happily have eaten the lot of them if I could have got away with it! Since finally getting a long-wished-for Vitamix several years ago I’ve made a lot of moussey desserts, mainly based on nuts. They aren’t quite as smooth or light as the mousses of my childhood, but they have their own charms. Soon I hope to start experimenting with aquafaba but until then, I’m mighty pleased with the peanut-butter and chocolate creation I made a couple of days ago, especially as I think it will work as a recipe even without access to a high-speed blender if a few modifications are made. The quantities I used made a huge amount, so I’ve frozen an ice-cream tub full in the hopes that it might work semi-frozen. If you’re going to try this I suggest halving the quantities, which will still make several generous servings! I put a cup of milk into the blender, followed by the peanut butter, flax seeds, then another couple of cups of milk and the extracts. That got blended up until the friction started heating the mixture, then I added the chocolate and sugar and it melted in and blended. It soon became evident that the mix was going to be too thick, so another cup of milk got added, then I poured it into a variety of containers and left it to chill in the fridge for a few hours. Once it sets it’s light and airy, creamy but with a slightly floury texture from the peanut butter. I daresay there would have been a smoother result from a more processed style of peanut butter, but this is fine, it’s kind of velvety! I also added a few mix-ins to some of the pots, such as oats and raisins, and I blended an orange into the last cup or so of mixture to see if that would work (it was okay, but probably not worth repeating). If I were going to make this without a blender, I would probably warm a couple of cups of milk, add the peanut butter and stir until it had thoroughly blended in, then add the chocolate and whip in another cup of milk, see what the texture was like and add more milk as necessary. I probably wouldn’t add flax if making a non-blender version as it’d make the texture grainy. If I try this version I will update this recipe, but if you happen to fancy trying it in the meantime please comment and let me know how you get on! I’ve now got a great way to use my peanut butter 😀. This sounds amaaaaaaazing. Currently revising my shopping list so I can try it! This sounds lovely! I’m trying to justify splashing out on a Vitamix, but I don’t think I can bring myself to do it just yet. I waited until I could get a free ticket to a show at an exhibition centre where they would be demonstrating, because they always have special deals at the shows. I think I saved about 25%? Looks fabulous. Why the flaxseeds? Just as an extra thickener and for a bit of added nutrition, but they could easily be left out.